Yahoo announced today the company is acquiring Tumblr for $1.1 billion. On the same day, Flickr introduced a brand new redesign of its website. The photo sharing site has been upgraded in many ways. It is in desperate need of a new look and it has finally arrived. To begin with, all users will now be offered one terabyte of free storage space. The previous limit for free accounts were 300MB of photos per month. The limit is off and users can upload as many photos and videos as long as they have space left, including long videos and very high resolution photos. For users who want to use Flickr free of ads, it will cost $50 a year and $500 a year buys an additional one terabyte of storage. 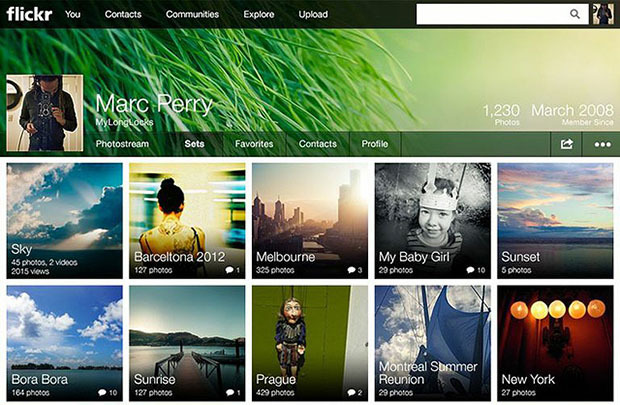 The brand new design Flickr has introduced puts photography at the heart of the user experience. It feels more like a portal for discovering new content. Friends’ latest uploads and photographs from other users are easily accessible. Photographs appear much larger on a new seamless layout. There is now space for a cover photo and a high resolution profile picture. The remake is perhaps the result of Marissa Mayer, who was VP at Google for eleven years and now the CEO of Yahoo, the parent company of Flickr. The new look reminds one of Google+. Photo sets are now much larger, and there is room to add short comment and stories to the photo collections.There is also a new slideshow mode that features new transitions and face detection technology to highlight key elements of photographs in front of the viewers. "In the beginning, Flickr innovated the way people share and discover photos. Today, we are shifting the photo-sharing landscape again. We’re releasing a Flickr that’s more spectacular, much bigger, and one you can take anywhere. A better Flickr is here. And not a moment too soon. With all of the power that you love, Flickr is now in it’s most beautiful form, and available to everyone."